Before you go about finding the best CMMS software for your organization, it must be said that there are hundreds of vendors, each with their own idea of what is important to maintenance professionals. 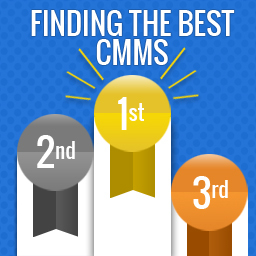 No one CMMS is best for all. Going through these five steps will help you determine exactly what you should be be looking for. To find the best CMMS software solution you need to first define the problems you are having. If your using an email system to process work orders you might be noticing that work is getting looked over or falling through the cracks. Based on this problem, you might set a goal of decreasing the number of customer complaints for the upcoming year. Having a goal in mind of how you want to improve your operation will help you ask the right questions when you interview different vendors. If you are having trouble determining the source of your problems here is a good paper on Developing a Maintenance Strategy and Setting Performance Targets. Now that you know what you want to improve, determine what features you will need to make it happen. CMMS software can serve a lot of different needs, but only some will actually be important to you and your maintenance goals. Referring to how you currently do things, make a list of bare bones needs that will be required for you to consider making the investment in new software. Be spoiled! You will be the head user of the software, you are not wrong for wanting certain things from it. Maybe you want advanced customizability or reporting on the go. Your wants will give you a point of reference to determine the value of different products. If you are faced with two similarly priced products that meet your basic needs, choose the one that satisfies the most wants. Piece of cake. Each CMMS software package will be priced a little differently. There are some vendors that will offer the best price at your current level of needs and usage, but as you grow so will the cost of the subscription. Be careful not to get integrated with a system that will nickel and dime your budget whenever you need to make a change such as adding users, capabilities, or customization. The best vendors will stay flexible as you grow. Here is a paper on How CMMS Software as a Service (SaaS) Pricing Works. You have to first accept that your team probably won't be adept at using, or willing to use, complex technology. The number one cause of software implementation failure is due to it being too complex and hard to navigate. Ideally, you want to look for a solution that is simple enough for your team to adopt quickly and feel comfortable using, but also offers the management ability you are looking for. Need a little more insight, check out our white paper.